Nava Tehila supports an emerging prayer and study community in Jerusalem by the same name. The community welcomes people of diverse backgrounds who wish to experience various expressions of spiritual life with a Jewish flavor. The community and prayers are egalitarian and inclusive and welcome members of other religions and "spiritual, but not religious" people who want to pray. Our prayer is experiential because we are constantly seeking ways of connection to the Living God in each and every moment. 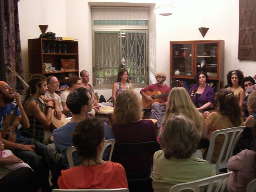 the community meets for Kabbalat Shabbat once a month in the Jerusalem neighborhood of Baka'a, As well as for the Holidays. Under the umbrella of the Amuta we offer Beit Midrash programs: classes and workshops in Jewish spirituality, meditation, Kabbalah and Chasidut, A weekly gathing space for Jewish music and interfaith events. The Amuta was form on 2008.